It's been a disruptive few weeks for physics. First scientists at CERN report possibly finding particles (neutrinos) that travel slightly faster than the speed of light (c), formerly thought to be the cosmic speed limit. They've asked for scientists around the world to confirm their findings or show where they have gone wrong. The neutrinos arrived 60 nanoseconds (a billionth of a second) faster than expected. This is an exceedingly short, but significant, time, amounting to a distance of some 60 feet in the 500 or so miles the experiment involved. Although the press touted this as possibly proving Einstein wrong, that was a bit of an exaggeration. General relativity has been tested and confirmed so many times that Einstein would be proven no more "wrong" by this than Newton was proved "wrong" by Einstein. You can still send rockets to the planets using good-old Newtonian mechanics without considering general relativity at all. Newton's laws are a very good approximation of how gravity works, within the limits where Newtonian physics is valid. The same would be true for Einstein's general theory of relativity. 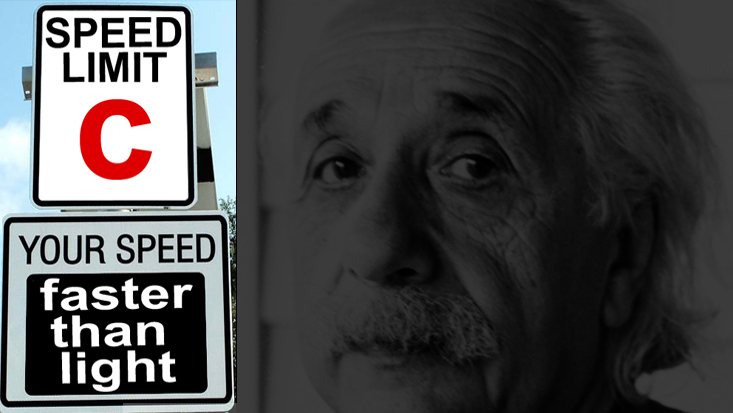 We'll have to wait to see how this turns out, but I have a feeling that Einstein will be vindicated. One reason for this has to do with neutrinos from supernova 1987A in the Large Magellanic Cloud, our nearest galactic neighbor at 168,000 light years distant. Supernovas release copious amounts of neutrinos a short time before the light from the explosion is emitted. At the distance of the Large Magellanic Cloud those neutrinos should have arrived a year before the supernova itself became visible, if neutrinos do indeed travel faster than light. Instead they arrived just a short time before, as predicted by current theory and a cosmic speed limit for light of 186,000 miles/second. There's an old saying in physics that the surest way to loose alot of money is to bet against Einstein. Or you could play the stock market.